2019 JCCP Student Innovation Fund Grantees Announced! 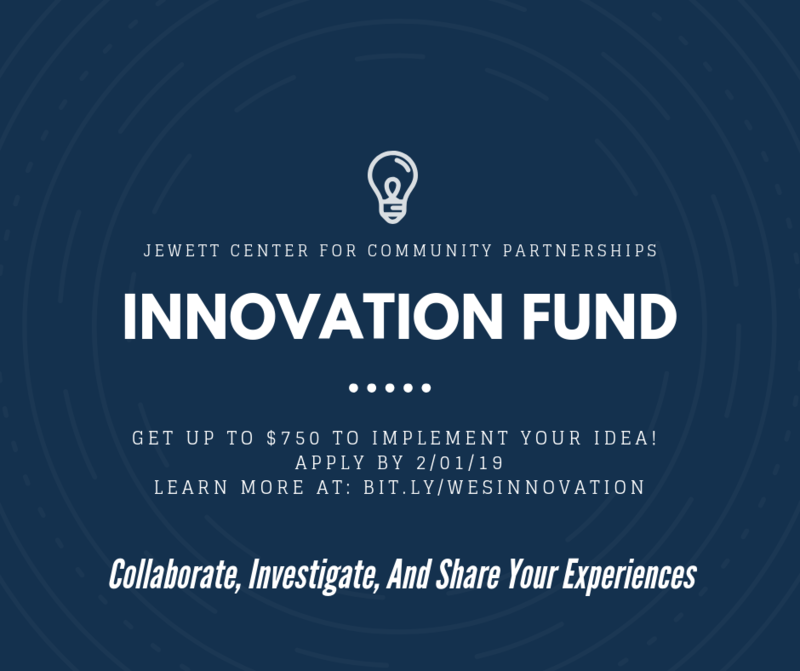 The Jewett Center for Community Partnerships is pleased to announce the inaugural grantees of the JCCP Student Innovation Fund. All student efforts are representative of the JCCP’s continued commitment to co-create mutually respectful partnerships in pursuit of a just, equitable, and sustainable future for communities beyond the campus—nearby and around the world. Due to the structural forms of racism that economically oppress people of color, volunteer opportunities are inherently restrictive. ASHA’s innovation seeks to investigate this barrier to the involvement of students color in volunteer opportunities,, as it is essential to the project of cultural competency for an educational organization to include members that represent the identities of many different students. The Student Innovation Fund will support their effort to make ASHA an inclusive and equitable organization. There are not many funding opportunities for young people, both high school students, and college undergrads, to help bring their ideas to life. In collaboration with the Patricelli Center for Social Entrepreneurship, the Student Innovation Fund will help Be The Change Venture expand its Annual Pitch Competition which supports high school and undergraduate students in their efforts to make a difference in their communities. Beyond Bus Cuts – a senior thesis project – examines Middletown Area Transit as a stigmatized social infrastructure and depicts the history of Middletown Area Transit together to not only disrupt this evident stigma, but to provide a historical context for its very existence. The Student Innovation Fund will support the maintenance of a primary written history of Middletown Area Transit and will also help with displaying these documents and clippings and ensure they are properly archived and displayed for future audiences. Learn more about Noah’s Connect Middletown project here. A collective of Wesleyan University students, Wesleyan alumni, Middletown residents, and local businesses are organizing and sponsoring the 2nd annual Cardinal Community Classic (CCC). The Cardinal Community Classic is a 3-on-3 basketball tournament hosted at Wesleyan University on April 28th, 2019. The Student Innovation Fund will help this collective achieve their primary goal, which is to raise money for the Middlesex Hospital Comprehensive Breast Center to support individuals affected by breast cancer in our local community, while also building sustainable relationships between the Wesleyan campus and Middletown communities. With the Student Innovation Fund, Cardinal Kids is addressing three gaps this spring. They are increasing Wesleyan student involvement with the Wesleyan RJ Julia bookstore, providing affordable, high quality literacy programming for Middletown youths, and are creating more opportunities for Wesleyan students interested in education. This project is providing a space at Russell Library for people in the Middletown and Wesleyan communities to tackle the challenges of communication. With the help of the Student Innovation Fund, they are facilitating conversations about different themes that are important to the group’s participants, making movement, sound, drawings or other art about it, and will have a final performance sharing at the end to show what they have done. In partnership with New Horizons, the Student Innovation Fund will support the implementation of several workshops of teaching and guiding women from Middletown and Wesleyan to embroider pieces that are meaningful to them. By creating a space that is open and welcoming to all women from a spectrum of different experiences, they will provide a safe environment that promotes women supporting other women. Through research-informed interventions, Retrain to Regain (RTR) counters the effects of toxic stress on the human body in the hope of creating a world where youth who are most disadvantaged have better health expectancies and social outcomes. RTR is an educational program that teaches youth ages 14-21 from marginalized backgrounds how to combat the effects of toxic stress while at the same time encouraging personal growth and development. The Student Innovation Fund will support the implementation of these workshops with McNair Scholars and Upward Bound students. Wesleyan Book Buds organizes book drives both on campus and in the Middletown community to collect children’s books to donate to low-income children at elementary schools, child centers, religious centers, and other educational organizations to help bridge the reading accessibility and achievement gaps. The Student Innovation Fund will help this group as they expand and run larger-scale community book drives. Stay tuned for project updates and how you can get involved! If you’d like to get in touch with any of these project organizers, email engage@wesleyan.edu.